The month of October gave us the opportunity to support Three Stone Hearth, a Community Operated Kitchen based in Berkeley, CA. Three Stone Hearth offers nutrient dense foods to homes and families around the San Francisco Bay Area. Their menu offerings change each week as they prepare global culinary offerings that highlight the nourishing traditions of various regions around the world. After a few events centered around Food Banks, we wanted to check out an organization where we could be involved in the preparation of food – a subject we are clearly passionate about. Our hostesses at Three Stone Hearth were Catherine Spanger (Worker Owner) and Jessica Prentice (Worker Owner) – two ladies very knowledgeable in food & nutrition, whom we found to be excited about our organization’s name and its purpose. 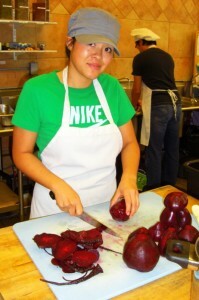 Boobs4Food SF Team Member Jessica cleaning & peeling nutrition rich red beets at Three Stone Hearth. We brought familiar faces along with a few new faces this time around as we supported the Co-Op Kitchen with the scrubbing of potatoes and carrots, the squeezing of fresh lemon juice, the chopping of buckets of onions without tears, the pureeing of ginger paste and the preparation of pounds and pounds of vegetables for the week’s menu of Shepherd’s Pie. All of this hard work wasn’t left unrewarded as we were blessed by an amazing communal tea service and lunch of delicate, delicious frittata with basil oil and yogurt and a lentil soup prepared by the day’s volunteers. Lunch was topped off by homemade ice cream courtesy of our dear Boobs4Food friend Nat who had churned out flavor after flavor for us to try: mango lassi, shanghai peach, apricot pecan & caramel pear. All and all, our afternoon at Three Stone Hearth proved eye-opening as we all learned more about the significance of the healing powers of food and how various regional cuisines and traditions have cultivated health lifestyles for centuries. Many thanks to Nat, Thi, Gino, Lynn & Jon for your time and much appreciated hard work in the kitchen. 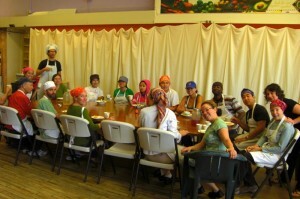 To learn more about our friends at Three Stone Hearth, please visit http://www.threestonehearth.com.